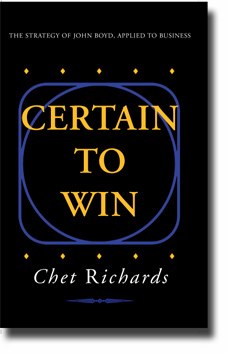 Certain to Win is available in hardcopy and electronic formats from most online booksellers, including the publisher — Xlibris — as well as B&N and Amazon. The publisher also offers quantity discounts (hint). I would be happy to autograph your copies of Certain to Win: The Strategy of John Boyd, Applied to Business. Please send me a note via the Contact page. Although I haven’t completed the new book I told my wife I’d work on when we retired 7 years ago, you might find some interesting new stuff in the papers “Boyd’s real OODA loop” and “John Boyd, Conceptual Spiral, and the meaning of life,” and the presentation Boyd’s Big Ideas — available on the Articles page. Just letting you know that both epub links are broken. Thanks. Will see if it’s possible to fix. Steven — Thanks. I published this page 8 years ago, when e-books were still something of a novelty. As you can tell, I’ve had other priorities in the meantime. Just posted a revision.